Brazilian wandering spider babies have been found by a British family while shopping in London. The family who found the creepy crawlies were forced to leave their home and stay in a hotel while the house was fumigated. Brazilian wandering spiders are known to be one of the deadliest spiders in the world. 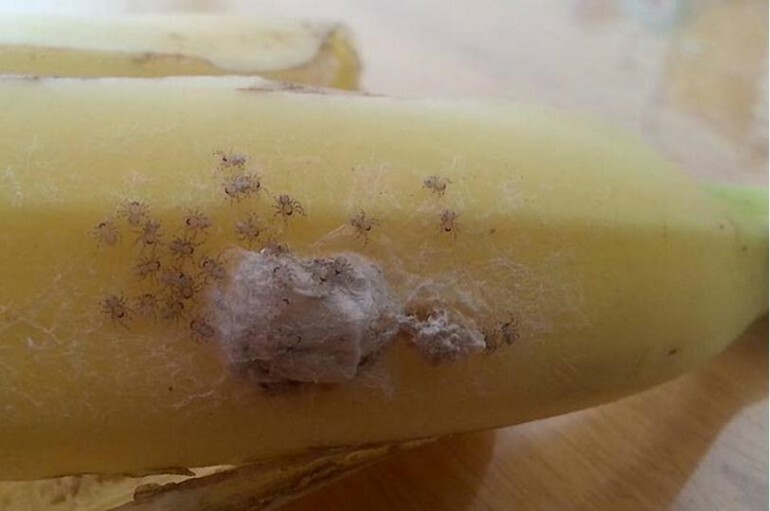 "I thought it was mold," said Consi Taylor, 29, who initially bought the bananas. "But when I had a closer look I saw some funny looking spots, and was horrified to see they were spiders." The spiders were most likely transported all the way from Brazil. Sainsbury's, the shop where the suspect bananas were originally bought, initially offered a mere ten pounds in compensation. However, since learning of Brazilian wandering spider infestation and the family's evacuation and fumigation, the supermarket has paid for the fumigation and the hotel stay. "We're very sorry and have apologised to Mr and Mrs Taylor," said a spokesman. "We do have rigorous controls on imported products at all stages -- from harvesting to transportation -- which is why this is so rare." Brazilian wandering spiders are not the only deadly arachnids found in Latin America. Spiders are common across Latin America, particularly in tropical regions where they can grow to enormous size. While the most venemous spiders are often found in South East Asia and Australia, Latin America still boasts its fair share of dangerous arachnids. Here are the Top 5 Deadliest Spiders in Latin America. 1. Brazilian Wandering Spider (Phoneutria nigriventer) Named by Guinness World Records as the most venemous spider in the world, this critter found in Brazil's banana plantations is also a very aggressive spider. Its venom contains a powerful neurotixin that can lead to breathing problems and even death. The venom can also cause priapism, meaning it causes erections that can last for days. 2. Chilean Recluse (Loxosceles laeta) has a particularly potent venom, though the spider itself is not aggressive. The bites of this aracnid cause necrosis -- tissue around the wound starts to rot, which can spread throughout the body in 14 percent of cases. The Chilean government showed that 3-4 percent of bites ended in death. 3. Brown Widow: (L. geometricus) has a neurotoxic venom that, drop for drop, is as toxic as the black widow's. However, brown widow bites are usually not very dangerous; usually much less dangerous than the black widow. Originating in South Africa, this critter has since migrated to Costa Rica, El Salvador and the Dominican Republic. 4. Yellow Sac Spider (Cheiracanthium) are found primarily in Argentina. While their venom is not hugely toxic, the necrotic nature of the wounds resulting from a bite often leads to MRSA infections, which can be serious. 5. Goliath Bird Eater (Theraphosa blondi) Though not particularly venemous, the sheer size of this spider necessitated its inclusion on the list. Found in the jungles of Brazil, Surinam, Guyana and Venezuela, this is the second-largest spider in the world. While it eats mostly insects, it has been known to eat frogs, snakes, mice and, yes, even birds.